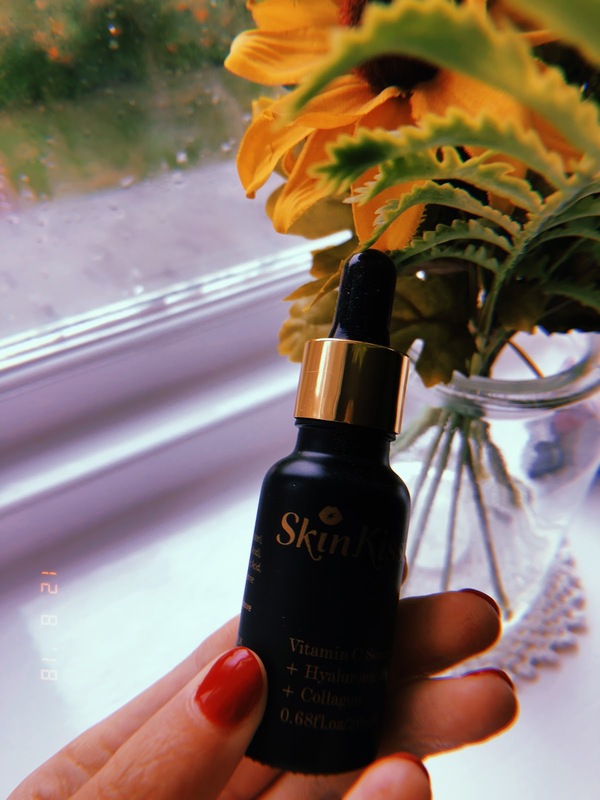 This is my review of the Skinkissed vitamin C serum. Firstly, I just want to point out that SkinKissed kindly got into with me and asked if I would be interest in trying this product for them and in return I would share it on my blog. By no means is this a sponsored post, it is just me giving my TRUE thoughts on what I thought about this product. This product arrived to my house just before I went on holiday so I have had 2 weeks to really try out the serum and actually see what its like on my skin. My skin type is pretty normal - well when I say normal it doesn't get that dry much only when the cold months occur but its not dry to the extent where I have to buy so many different products. I also do not get a lot of spots and I remember once I started getting spots when I started wearing foundation on my face purely because my skin wasn't used to it but that stopped a long time ago and touchwood I haven't had any issues. So I am very lucky with my skin, I do get a bit of redness around my nose occassionally but nothing too much. The serum is packaged in a black bottle with a gold pippette on the top for applying the product. The label on the front displays the name, ingredients, product features, caution, quantity of product and company details. It contains 20ml of product and retails for £29.95. As I looked at the bottle I noticed that one of the ingredients said it had Collagen and next to it in bold letters said FISH. Now that scared me a bit purely because I did not want to be applying something to my face that smells of fish. I love fish but I certaintly don't want my face smelling of it so I removed the pippette and I was very pleased to say you cannot smell fish at all. In fact it smells of rose water which is a lovely touch. As like any product you choose to purchase it tells you about allergies and this states if you have an allergy see in bold which relates to the FISH. When the product arrived it came in no box, just in bubble wrap which I thought it was rather disapointing as I was expected the serum to come in a lovely box with some information from Skinkissed maybe saying 'Hi Lottie, thank you for letting us this product to you. Have fun testing' or something like that but nothing. It didn't even tell me how to use the product so I had to go onto their website to find this out!! Beauty - use it twice a day, morning and night after washing your face. It can be used beneath your moistursier, or any follow up step of your skin-care routine. Make up - Use it as a primer under your foundation, or apply as serum on your brush to blend your makeup. Skin care - Use it as a treament for oil skin and acne problems by combining it with your other skin treatment routines. I also found out whilst looking on the website after Skinkissed sent it to me how the product is not tested on animals and how all of their products are 100% free. I think it would be such a great idea to actually have that on the product. I applied the serum on a morning and night using 3-4 drops to cover my face and neck. I started to notice the results a few days in and my skin felt amazing, it was very soft and left my skin feeling flawless. It made my skin glow throughout the day and also very hydrated too and it was a great feeling. The bottle itself is perfect for traveling as it is so small and you also don't waste any product either. The only negatives I would say is I found the product very sticky and runny. If I was applying it in thr morning as a primer I would use 3 little drops on my face just saw its not too sticky before you start applying your make up. On a night I used 4 drops on my face and neck which I actually could of used 3 instead purely because of the stickyness. Having said that I am very happy with the results as I was worried I would get break outs and skin irratation but no touchwood everything is good. Here is a photo of my face after using the serum. Have any of you tried this product? If so, what did you think? I would love to know.